Ordin Gandread is a human Inquisitor of Sarenrae with the Fire Domain and loves to use his Fire Bolt. He wears a red trenchcoat that, when closed, shows the symbol of Sarenrae, but only his breastplate when open. This allows him to appear as a normal individual when need be as well as a holy warrior should his need arise. The coat also has a hood, which he has up most of the time to improve his intimidating prowess. On his back is a backpack full of the most random crap that he usually uses, much to the chagrin of his party. His weapons are a heavy repeating crossbow and a scimitar. 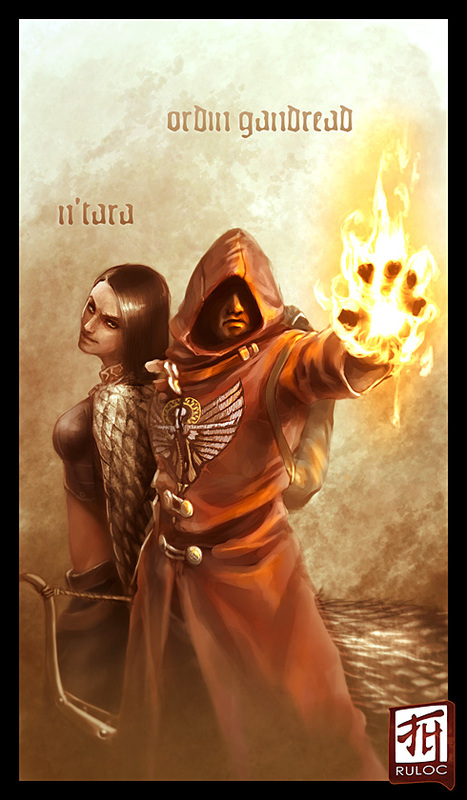 N'Tara is a Cross blooded Sorceress, Human female, with shoulder length black straight hair and yellow eyes. She wears a black corset looking thing around her chest showing her stomach, black leather pants, and a coat made of copper dragon scales.